Anthony DiBernardo is the enthusiastic, larger-than-life Pitmaster and Owner of Swig & Swine BBQ in Charleston and Summerville, SC. 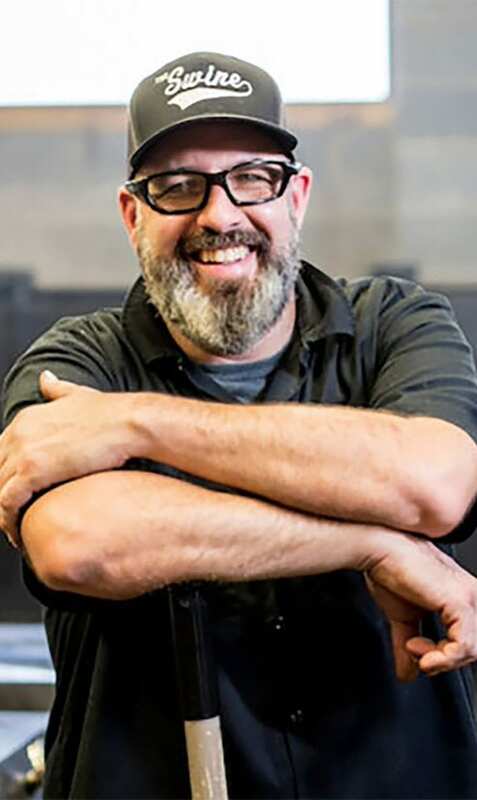 With his 25-year culinary background and deep-rooted BBQ passion, Anthony opened Swig & Swine in 2012. Swig & Swine has become a fast favorite among enthusiasts worldwide with mouthwatering meats from prime beef brisket and whole hog, to house-made sausage and ribs. Each meat is slow cooked to perfection in DiBernardo’s custom smokers that uses only wood to fuel the fire 24/7. Anthony was born and raised in Mantua, NJ. He entered the culinary world at 14 as a banquet cook, and left for the U.S. Navy at 18 where he was cook on the USS Batfish SSN681 for four years. Once his submarine landed in Charleston in 1990 he started working in the kitchen at Blossom, and later served as Executive Chef at Kiawah Island Resort, Mustard Seed, and Rita’s.